Designed to enhance your recruitment business, streamline workflow and increase profitability, AimStar is leading-edge, fully customizable recruitment software. 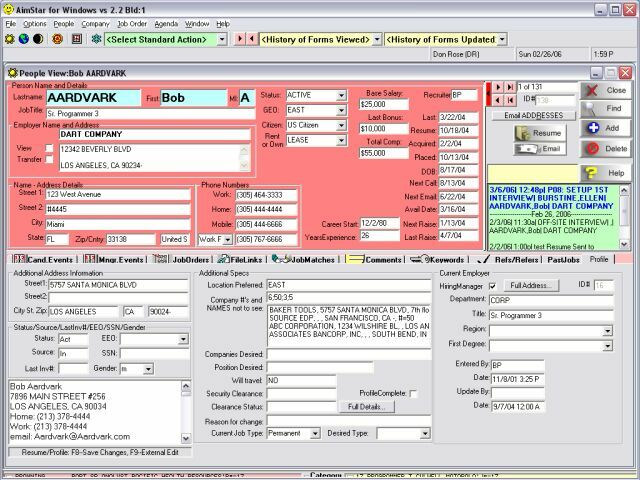 The result of over 15 years database software development, AimStar features a unique user interface, automated resume import facility, powerful search and match capabilities, desktop communications center, appointment and events diary, comments and history notes, sophisticated joborder management with full Web integration. Displayed below is the main People Screen, showing the general split-screen layout. All primary data screens (People, Company, Joborder) follow the identical layout. Whatever the size of your business, AimStar provides a complete software solution for managing permanent, contract, temporary and executive search. A high level of process automation means that AimStar releases your busy recruitment consultants from much of the burden associated with time-consuming, mundane office administration. Instead they can focus their valuable time and talents on core business activities, equipped with the tools necessary to make your business grow and prosper.